Certainly not fun in the way the “Kingsman” films are, never the less this is a satisfying spy thriller with enough of a story to keep us engaged and a couple of characters that give us some rooting interest but not a lot of sympathy. The action is reminiscent of the style of the Joh Wick movies but without the irony and gore fetish of those movies.The film is so serious that modern audiences might not recognize it, because it is not a parody or a send up or pastiche, it is a drama. It is told in a straightforward manner and I don’t think these is a single moment in the film where you will catch anyone winking at the audience. 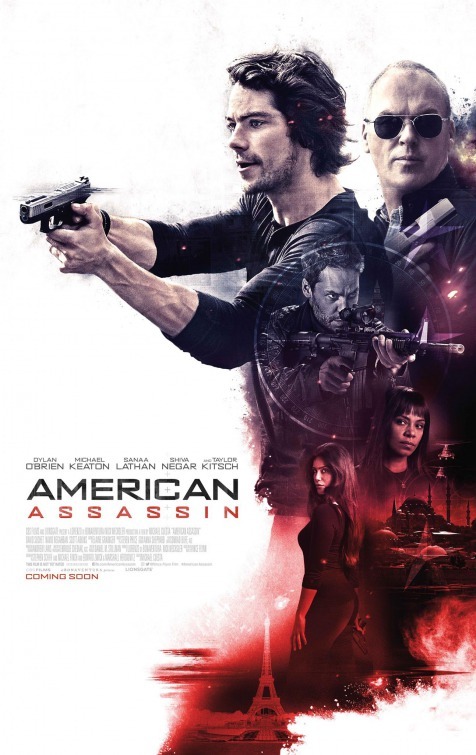 American Assassin is not for everyone. I have read two or three of the Vince Flynn novels that feature the lead character Mitch Rapp. He is not James Bond. He is a dedicated killer, committed to wiping out threats to America. There is no nuance to his attitude and people looking for the grey zones between who is right and who is wrong should seek their entertainment elsewhere. Mitch is just going to kill the bad guys, and he is not stylish about it but he is efficient. Young Dylan O’Brien does not look like the Mitch Rapp I had in my head, but this is an origin story and if the series gets a chance to continue I’m sure he will mature into the role more. Seven years ago, Taylor Kitch would have been the choice for Mitch in this film, instead of the bad guy “Ghost”. So it makes sense to cast him in the role of a former agent that has gone rogue. The plot is not particularly unique except in the way it can visualize a world where Iranian operatives might cooperate with the CIA. The ultimate target of the attack is also somewhat interesting although it seems a by inconsistent with the character. The opening scene with an attack on tourists at a beach resort is brutal and may seem a little too real in the way it is depicted. The terrorists are indifferent machines, going through the process of killing as many people as they can. The personal psychological trauma inflicted on our nascent “hero” is understandably sufficient motivation to shed himself of the humanity, a characteristic that distinguishes Rapp from other characters in this genre. Much of this film takes place in the light of day and I enjoyed getting a tour of Istanbul that was maybe a little brief. The more extended tour of Rome was a nice compliment to the nighttime tour we got in “Spectre” a couple of years ago. Both of these cities are highly photogenic and they are different enough for this type of film to tale advantage of. The real draw for people who make an effort to see this will be Michael Keaton. I really appreciate having him as an onscreen presence in films so much more often these days. Those of us who remember his debut in “Night Shift” will be amazed at the spectrum of characters he has ended up playing. As the hard as nails CIA trainer Stan Hurley, he manages to be believable, even when he is being tortured. His no nonsense approach to personnel will probably not endear him much to real CIA recruiters but as a film character he is exactly right. Most of the film is SOP when it comes to these sorts of stories. There is one really great fight scene in a speedboat that makes a creative contribution to how these stories are told There is a solid use of real physics in the fight that is the closest we come to a cinematic shot in the film. As the high speed boat rockets across the water and it encounters a large wave, the combatants are thrown into the air and off of their attacks momentarily. It’s not something I’ve seen before and that’s why I appreciated it so much. Frankly, I’m not that complex when it comes to this kind of film. I root for the Americans, I enjoy the revenge plot and I was satisfied with the action beats. This is not a film that you would call artistic or great, but it is one that will leave people who want to have this kind of experience, sated.